Simple and Easy Sweet and Sour Chicken Recipe! Sweet and Sour Chicken with crispy chicken, pineapple and bell peppers that tastes just like your favorite takeout place without the food coloring. Perfect balance of sweet yet sour Asian flavors that the whole family will LOVE. You will love this Simple and Easy Sweet and Sour Chicken recipe. Simple and Easy Sweet and Sour Chicken! In our house, we LOVE Asian inspired foods. We don’t do Chinese takeout often (and for many many reasons). I came up with this recipe, Simple and Easy Sweet and Sour Chicken as an experiment. Which is how I mainly like to cook. Anding in a little of this and a little of that can be a lot of fun. Some recipes turn out as duds while others make the “make again” cut. This made the cut and I have been making it for years. This recipe calls for a simple sauce that’s packed with the perfect balance of sweet, yet sour Asian flavors. Soy, sesame, garlic, and more. 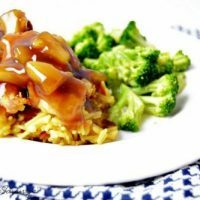 The sauce coats the chicken nicely and really makes this dish what it is. You’ll likely have extra which I could eat by the spoonful. Seriously, no lie! I always keep a spoon nearby for “tasting” purposes. That is at least what I tell everyone. First, in a large non-stick skillet or wok, heat oil over medium-high heat. Coat chicken with tempura batter and add to pan. Cook chicken until browned on all sides. After chicken is fully cooked, I like to get as much oil off as I can. Using a paper towel drain grease from chicken. Then set chicken aside. To prepare the sweet & sour sauce; Put all ingredients listed below (for sauce) in a saucepan (dissolve cornstarch in water), stir and bring to a boil. Stir frequently until thickened. Add your crispy chicken to your sweet and sour sauce. Once thick add in pineapple chunks. Remember your “tasting” spoon? Pull that out and let your taste buds enjoy your cooking. I like to serve this recipe with a side of vegetable. However, I have added my veggies right into the sauce with the chicken. Either way, you serve it up, it will be delicious. Once you make this recipe, you’ll be surprised how easy it is to mimic Chinese take-out food. I personally think it tastes fresher and a lot healthier than take-out. In fact, after I eat Chinese food takeout I end up feeling quite bloated and my fingers always swell up as a result. I prefer making my own versions at home. Also, investing in a good wok will help with cooking. It isn’t necessary, but it does make cooking this dish easier. I love using my wok and actually use it for non-Asian inspired meals. In the meantime, prepare the sweet & sour sauce. Put all ingredients in a saucepan (dissolve cornstarch in water), stir and bring to a boil. Stir frequently until thickened. Once thick add in pineapple chunks. Serve over rice. 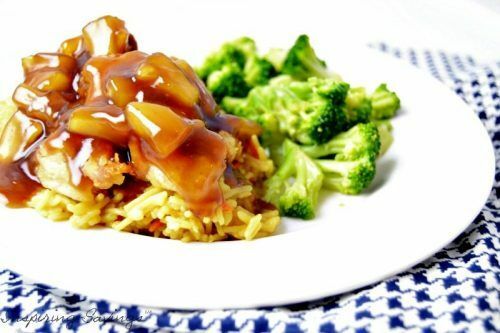 Spoon chicken and Sauce over rice. We like to have a side of steam broccoli with this meal.